If you've been on Pinterest at all you know that there is a wide variety of just about everything that you can find and pin to your own boards. If you haven't been on Pinterest, you should definitely try it out! Well I found and tried out a couple of dessert recipes that I've pinned so I thought I would share these two delicious pies with you. 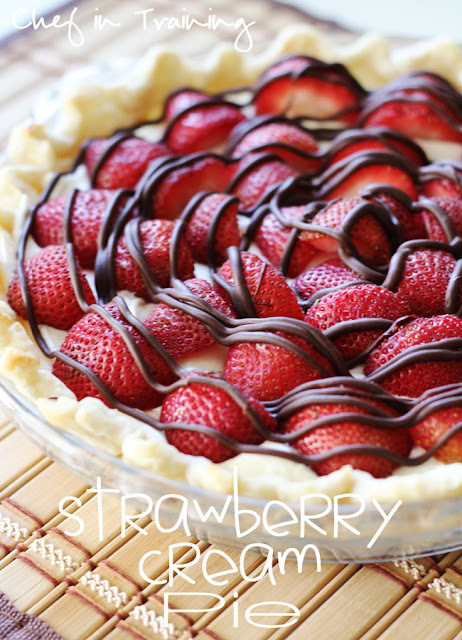 First up is a Strawberry Cream Pie. This recipe was created by Nikki at Chef in Training. I just love Nikki's blog! She always has the most wonderful recipes. 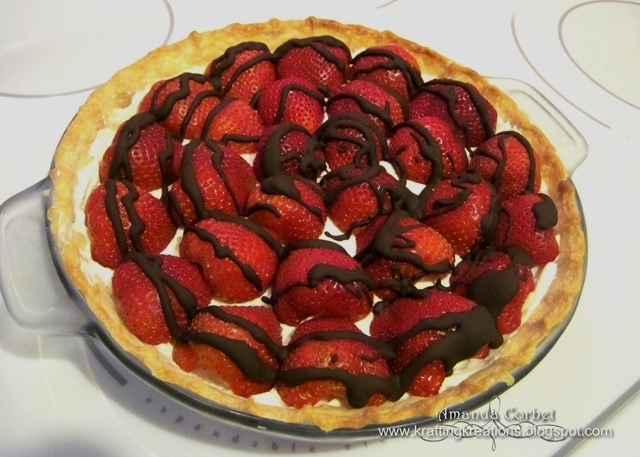 Here is a picture of her delicious looking pie. Now here is a picture of mine. My swirls of chocolate were not anywhere near as even as Nikki's, but it still looked delicious. In her recipe she mentions that you can use either Vanilla or Almond extract. I've tried both and let me tell you, it is OMG amazing with the almond extract! 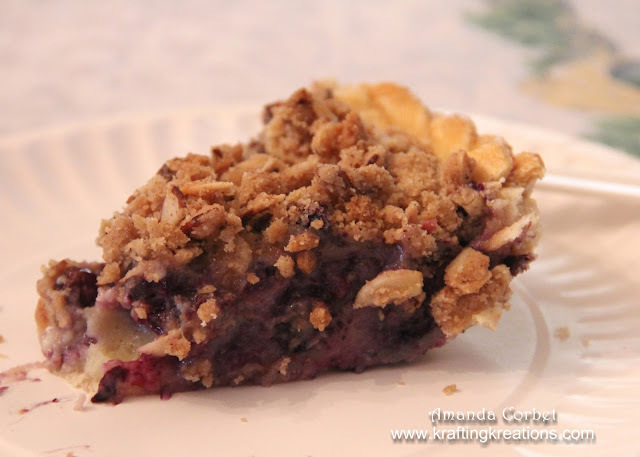 Her recipe is super simple and turns out a wonderfully delicious pie! You can find Nikki's recipe HERE. The second pie is a Blueberries and Cream Pie. Now I was pretty skeptical about this recipe. I"m not a huge fan of blueberries, but it looked delicious. I think this is now my favorite pie ever! (Well...other than Mom's apple pie. Nothing is better than Mom's apple pie.) Anyway... unfortunately I can't find the website that this was originally pinned from. All of the links I've found seem to be broken. But thankfully I had saved a printed copy of the recipe! The original blog was Gingerbread Bagels. Note: I also added a small package of slivered almonds (about 1/2 cup) to the topping. In a large bowl, mix together the flour, sugar and kosher salt. Put the bowl in the freezer for 5 minutes. It’s important that the ingredients for the pie crust are very cold. Dice the shortening and also place it in the freezer for 5 minutes. Take the bowl out of the freezer and add in the shortening. Using a fork, cut the shortening into the flour. The mixture should resemble small peas. Mix together 1/2 cup very cold water (I put the water in the freezer) and 1 large cold egg. Add it to the bowl and mix the ingredients together in order to incorporate everything. Put the dough onto a floured counter and form it into a large circle. Cover in plastic wrap and refrigerate for at least 2 hours. Take the dough out of the refrigerator and take off 3/4 of the dough. I always use a little more so it’s easier to roll out. You can reserve the extra dough you don’t use for another pie. Flour the counter, rolling pin and the dough. Roll it out into a large circle. Then roll the dough onto your rolling pin. Roll the dough over the pie plate (a 9 inch pie plate) and press it into the insides of the pie plate. Crimp the edges of the pie or if you can just take a fork and crimp the edges. Place the pie in the refrigerator while you work on the filling. In a bowl of a stand mixer with the paddle attachment, mix together the sugar and flour. Add in the sour cream, eggs and vanilla extract and mix until combined. Take the pie out of the refrigerator and put the blueberries on the bottom of the crust. Pour the filling over the blueberries and spread it out. Mix together the sugar, brown sugar, ground cinnamon and ground nutmeg. Pour the melted unsalted butter into the bowl and mix everything together. Add in the flour and mix until the ingredients form a crumble topping. Crumble the crumb topping over the pie. I hope you enjoy these fabulous pie recopies!